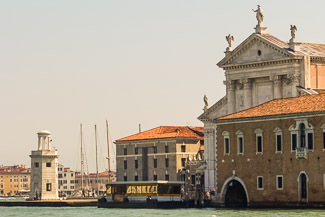 San Giorgio is the waterbus stop for San Giorgio Maggiore, an island church and monastery facing St. Mark's Square. The church (designed by Andrea Palladio) is well worth a visit. While you're on the island, take an elevator to the top of the campanile, or bell tower, for spectacular views of the monastery complex, the city, and the lagoon.